NOTE: The map above is from the 1950's and while currently accurate should not be used as a primary source of navigation. 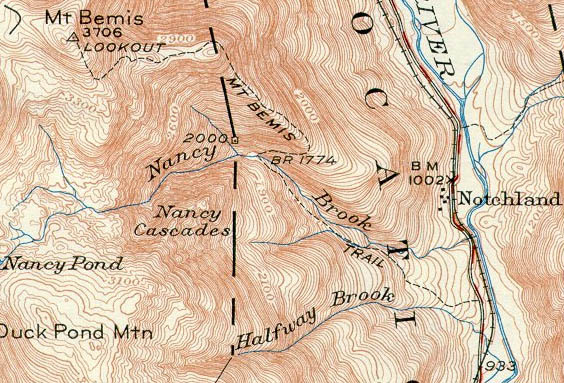 DESCRIPTION: Hiked the Nancy Pond Trail to the abandoned Mt. Bemis Trail. Take the Nancy Pond trail 1.7 miles to a stream crossing of Nancy Brook. The Trailhead is directly after the stream crossing to the right. There is a geocache called the Mt. Bemis trail and the trailhead coordinates can be found on Geocaching.com (search for GC1V5BQ). The abandoned trail is well used and easily defined until the summit ridge where the spruce gets much thicker and with several blowdowns the trail is much more challenging and pace slows. The trail proceeds through an open area which presents incredible panoramic views and the best of the trip. You'll eventually ascend upwards reaching the tattered remains of the old fire tower. The true summit and most challenging bushwhack of this journey are a 100 yards West. I haven't been on a serious hike in several years and Mt. Bemis was a great way to easy my legs into the groove of returning to the woods. The Nancy Pond Trail ascended gradually to the Mt. Bemis trail which, for an unmaintained trail was in excellent condition. The spruce got thick and blowdows got heavy once we attaned the summit ridge but it was only a short distance and only slightly slowed our speed. We proceeded through an open ridge which would have offered substantial 360 degree views of the area if not for the low cloud cover and overcast conditions. The photo above is the remains of the firetower while standing on the deck platform. The summit is ~650 Ft to the West and a very thick and arduous bushwhack. The 3725 Ft Mt. Bemis summit canister.